A longitudinal section of a flower of a flower of Hydnora africana from the cultivated plant. Notice that the flower is attached to the horizontal, knobby brown root (horizontal, at the bottom of the picture). At the top of the flower are two of the "sepals" (perianth segments) that can be seen above the surface of the ground. They are orange inside. Just below where these are joined is a short tube. At the top of the tube, one can see some yellowish-orange structures protruding into the tube. These are two of the three anther-groups. Hydnora flowers don't have stamens in the ordinary sense. There are groups of anthers united into bunches. At the bottom of the tube is a stigmatic area. The basal part of the flower has a cavity in it. At the top of the cavity are white ovules. The ovules will mature into seeds. 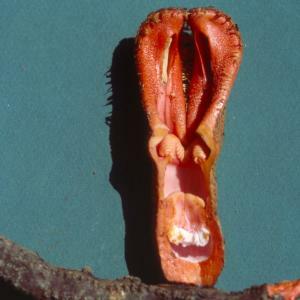 The flower of Hydnora is a kind of intricate trap. Or, as we will see, a temporary trap.